Well, sort of new. Remember the Rowan & Martin show…? Goldie Hawn got her start there. Some guy popping out from behind a potted palm wearing a World War Two German military helmet saying: “Very interesting. But not funny.” Y’know – Laugh-In? I liked bits and pieces of that show, including the weekly “Fickle Finger of Fate Award.” The hosts would come across something insane, something they felt we should know about, something to let the perps know that we all knew what they’d said or done. 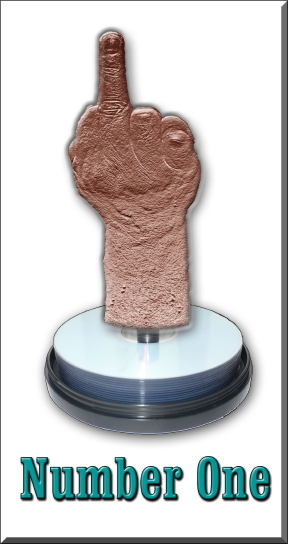 Thus, on the verge of the Federal Government’s Speech from the Throne (read by the Gov-General but really an edict from the Prime Minister’s Office) and the Conservative Government’s Budget… I hereby unveil the “Number One” Award (aka the NEW Fickle Finger of Fate Award). I suspect we already know who’s the odds-on favourite to snag this first offering, but why don’t we keep it between Price-Waterhouse-Cooper and the Academy for the time being. Just know that whoever is the lucky recipient from hence – YOU will forever be NUMBER ONE in our books. Suggestions for future recipients most welcome. Let’s make this a weekly event, so keep those suggestions coming. Jennifer, I probably should have insisted that people explain the reason for their nomination. The Academy is on hold…. BTW, I understand why the Mayer nomination. I’m just not sure that others will, especially if they don’t take the time to follow your links. I nominate Marc Mayer, the Director of the National Gallery of Canada, for revealing how little understanding he has about art, the country he lives in, and the political/power structures that limit the opportunities of artists to be seen and heard. In February 2, 2010, the Director of the National Gallery of Canada appeared in “Diaspora Art,” a spot aired on CBC’s The National. Today Mayer tell us that NGC doesn’t show ethnic minorities because they are not achieving “excellence.” The simplistic notion that connoisseurs know “good art” was thoroughly discredited by 20th-century feminist and post-colonial writers, artists and activists. Ahem… for my first nomination, of this first ever Award, I have two names or things to present. First, Joe Quesnel. Here is a man so confused about his own identity that he gives new meaning to the term “autophobia.” At least, when it comes to his frequently professed but never proven Mohawk, or Métis, or Indigenous side. My second choice, by only a whisker, is the National Post. This right-wing rag gives fish wrap a bad name. It makes me cringe to put in at the bottom of the bird cage in case the bird ever learns to read. It’s on-going anti-Indian or anti-Indigenous rights campaign is there for all to see (although I’d suggest you spend your money more wisely playing craps in an alley with high school students). Rock on, you two. You deserve each other. I have a friend who is a white male (gasp) and he once said that he didn’t know if racism still existed. This stunned me, but then I thought about it, and well, since he never experiences racism or any other kind of discrimination based on his identity, why would he think it exists? (Okay, maybe he could have figured it out by reading or watching news, or something, but anyway.) Now, I have met some white guys who seem pretty aware that racism and other discrimination exists, but it’s not something they’ve actually experienced. I tend to think Mayer falls into the former category – doesn’t know if it exists and hasn’t experienced it – but he is not as nice or as willing to consider new ideas as my friend is. So there.